Tennis Canada announced Wednesday the list of players who will compete in the 2018 edition of the National Bank Canadian Open Junior Championships. Sanctioned by the International Tennis Federation (ITF), the Grade 1 junior tournament will be held from August 26 to September 1 at Parc De La Rochelle in Repentigny. 15-year-old Leylah Annie Fernandez (Laval, QC) is expected to be the tournament’s third seed in the girls’ draw. The young sensation is coming off of a great first half of the year, which saw her reach a career high junior ranking of no. 13 in the world, capture the title at the Grade A ITF tournament in Brazil as well as reach the semi-finals at the Junior French Open. The Laval native also made waves on the professional circuit, notably reaching the second round at the Granby Challenger and moving up over 100 spots in the WTA rankings. Just a few weeks ago, she reached the second round of qualifying at the Rogers Cup in Montreal, as she won the pre-qualifying tournament, defeating a number of other Canadian players in the process. 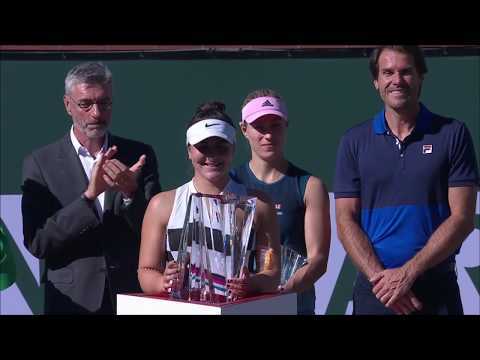 Last year, she captured back to back titles at Grade 2 junior ITF events in Israel and reached the quarter-finals of the Saguenay Challenger on the professional tour. She will be looking to avenge her 2017 second round loss in Repentigny. Tennis Canada also announced a few of the main draw wild card recipients. On the boys’ side, Taha Baadi (Montreal, QC), Justin Boulais (Toronto, ON), Liam Draxl (Newmarket, ON) and Antoine Marleau (Repentigny, QC) received passes for the main draw. Boulais and Baadi have had recent success, with both players reaching the final at the U18 Rogers Outdoor Junior Nationals. It was Boulay who got the better of his compatriot 6-0, 7-6(5). There are two boys’ main draw wild cards remaining as well as four for the qualifying draw, one of which will go to Nicolas Ocana Lavoie. On the girls’ side, Ontario native Jada Bui has been awarded a wild card, following her performance at the U18 Rogers Outdoor Junior Nationals, where she was crowned champion. The rest of the wild cards will be announced at a later date. On the international front, the tournament will welcome five Top 10 players in both draws, including world no. 4 Nicolas Mejia of Colombia. The 18-year-old currently holds a record of 19 wins and 9 losses since the start of the year and made deep runs to the semi-finals at Junior Wimbledon and quarter-finals at Junior French Open. Among the tournament favourites will also be Hugo Gaston of France. Currently ranked no. 5 in the ITF junior rankings, he has won two doubles and one singles title since the start of the year. In 2017, he was crowned champion at the Orange Bowl, one of the most prestigious junior championships in the world. The tournament will also play host to a number of top ranked junior female players, including world no. 9 Clara Tauson of Denmark. At only 15 years old, she already holds nine junior titles, five of which she won earlier this year. Tauson reached a career-high junior ranking of no. 8 in May of 2018 after reaching at least the semi-finals in four consecutive tournaments. Yuki Naito of Japan is expected to be the second seed in the girls’ draw. Earlier this year, she had her best performance at a junior Grand Slam, reaching the quarter-finals at the French Open. The 17-year-old currently holds three singles and seven doubles titles on the ITF junior circuit. The National Bank Canadian Open Junior Championships is the only Grade 1 ITF junior tournament in Canada. The tournament welcomes the best players from around the world between the ages of 14 and 18.